We’re headed into the fourth week of the school year, and I still haven’t gotten my after school routine down. Seriously, it’s bedtime when it used to be dinnertime, so I’ve been finding myself scrambling for a quick dinner far more than I’d like. 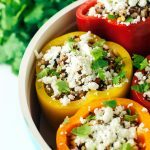 These Southwest Grain Stuffed Peppers, however, are totally worth the extra cooking time. 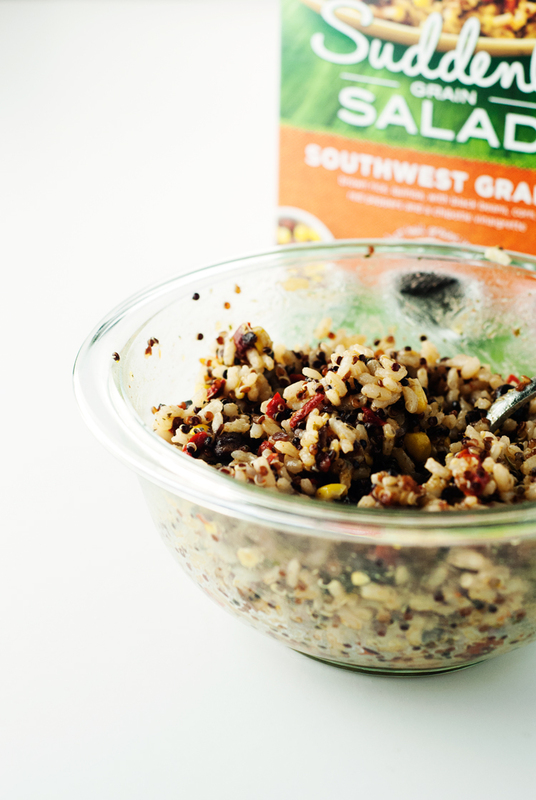 The secret to these beauties is Suddenly Grain Salad Southwest! It cooks with the quickness, just pop the bag in boiling water and voila! 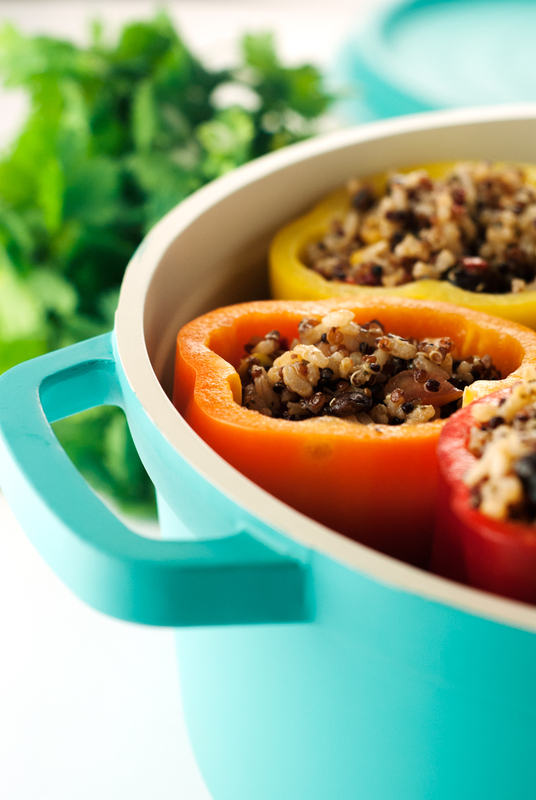 The dressing has a delicious spicy kick, which makes these stuffed peppers extra yummy. And wouldn’t you know it, the kids went absolutely nuts for these stuffed peppers. I topped them with some queso fresco and cilantro and they gobbled them right up. Parenting win, I think! Plus, it makes a great vegetarian option, so double plus bonus! Woo! If you’re looking for a different flavor profile, you can grab the Harvest, or Tuscan variety for some fun stuffed peppers. $25 Target GC! Have Dinner On Me! Preheat oven to 400 degrees. Fill a 3-quart saucepan just over half full with water and bring to a boil. Add the Suddenly Grain Salad bag to the water and allow to boil for 10-12 minutes, flipping the bag over halfway through. While the grains are cooking, add the dressing seasoning, oil, and water, to a medium-sized bowl and whisk to combine. Set aside. Drain the bag of grains in a colander, then rinse the grains thoroughly with warm water. Add the grains to the bowl with the dressing, and toss the diced tomatoes in as well. Gently stir to coat the whole mixture with the dressing. 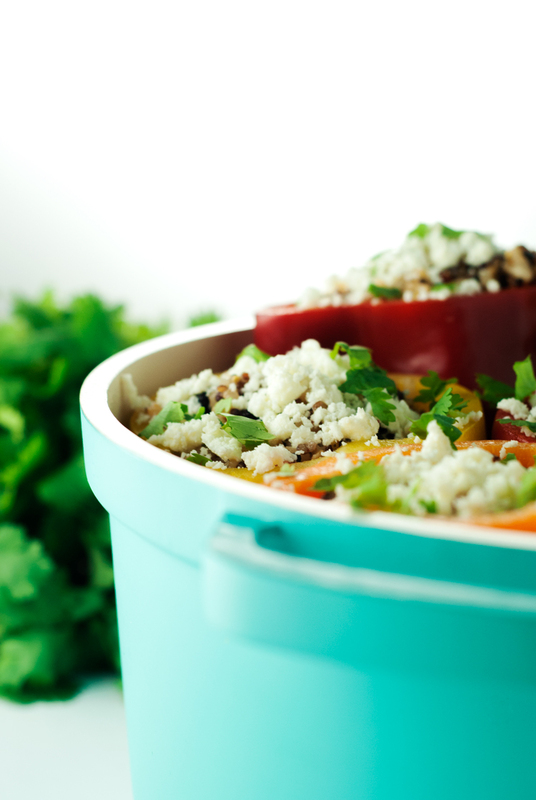 Stuff each bell pepper with the mixture to the top, then place in a large pot, cover, and bake for 40 minutes. Remove the cover and allow to bake for an additional 5 minutes. Remove from oven. 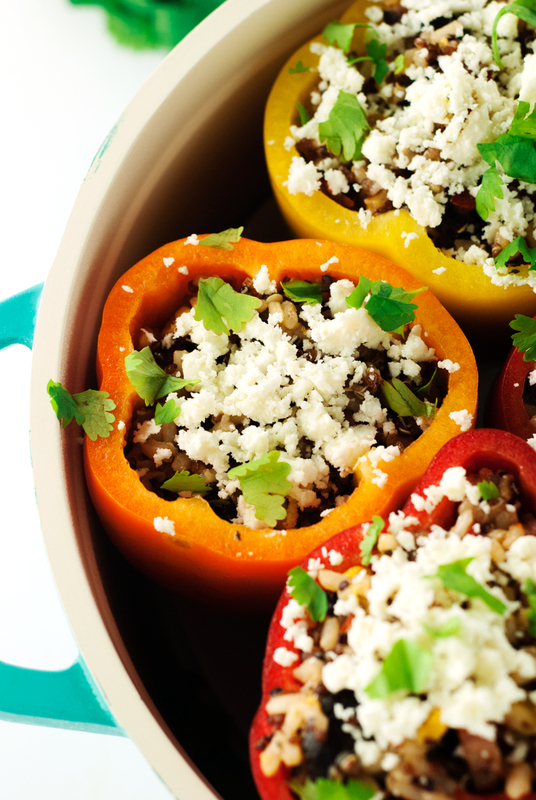 Top each stuffed pepper with queso fresco and cilantro and serve immediately. Dear Karly, What a great meal! Love the different colored peppers and what a quick and delicious filling. Queso fresco is a favorite of mine. 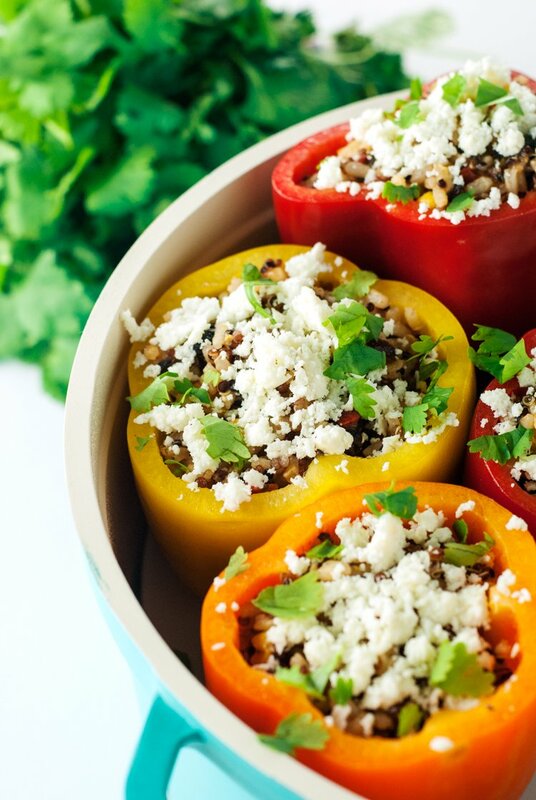 We will definitely be trying these stuffed peppers! we love stuffed peppers - just had some this weekend! I love the idea of a quick filling like this, yum! Looks delicious! Easy to make too. Who care if it takes 55 minutes to cook. More time for enjoying a glass of wine while helping kids with their homework! Stuffed peppers are the perfect Fall comfort food. These look delicious, and I love that you used queso fresco. SO good! Love stuffed peppers! Totally need to try this recipe. Looks delicious. I've never seen that in the store. Will have to check it out.